Here a group of country craft sit on the sea bed at low tide at al-Bida, on the east coast of Qatar in the 1970s. It was a common sight and one that brought to life the relationship between craft on the sea and the traditional buildings immediately inshore. But although there appeared to be a common type of boat, it was noticeable that there were differences. 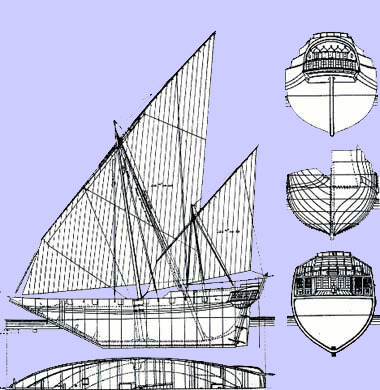 Looking more closely at them it was problematic sorting dhows into a structured pattern as Arabic craft are identified by their hull type and the functions they carry out, but here is an attempt to set out some of the common craft. Bear in mind the warnings I have given elsewhere on the variety there are within the Gulf both in terms of type and function, as well as name. This was the largest type of boat in the Gulf and is now rarely seen. Those that are still in use tend to operate for ceremonial or special purposes. They have curved, decorated prows and a high transom stern and poop. In this respect they have a similarity to European craft. This drawing of a baghala was taken from Paris’ Souvenirs de Marine, 1882 and additionally illustrates the lateen sails common to dhows. I see that the baghala in this illustration has a straight prow and that the lateen sails have a luff – the leading edge of the sail as opposed to the leech, the trailing edge. The addition of the luff adds a significant element of sail compared with a triangular sail, increasing the potential speed of the craft. You can also see that the main lateen yard is constructed of two pieces of timber due to its length. This photograph was taken in Kuwait and is of the stern of a baghala that was built between 1997 and 2000. There are few of these craft around nowadays and those that are built, such as this, are usually for recreation or display. Although construction is greatly modernised a significant amount of the work is carried out manually by craftsmen keeping the tradition of these great boats alive. The reason the ocean-going baghala is said to have died out is that it was found to be prone to difficulties with its squared stern in a following sea. To get over this problem Kuwaiti boat builders designed the boom, a craft with a very different stern and one which was designed to move large cargos, as had done the baghala. The boom is the most common of the large dhows likely to be seen in Qatar. To all extents and purposes I believe they have effectively replaced the baghala and are the largest of the craft regularly trading within the Gulf including Iran, and to the east coast of Africa as well as to the ports of the Indian sub-continent. The baghala is now an endangered species, very few of them still in existence, and certainly none based in Qatar. The boom can be readily distinguished from the baghala by its curved transom and a long, straight stem post raking out at an angle of about 40º. The boom can be much larger than it may appear to be at first sight. They are commodious being both broad and deep. I have seen two buses sitting on the deck of one of them, one each side of the mast and not looking at all crowded. Here one of the buses has already been loaded onto a boom, the second of them waits on the quay to be lifted on board by the attendant crane. Something of the size of the ocean-going boom can be seen from this image of a beached boom, this one displaying the Kuwaiti flag. The photograph illustrates the fattened shape of the hull which is designed specifically to optimise the carrying of large loads. Nevertheless, the craft has also developed a good-sized keel in order to maintain a degree of stability and enable it to move accurately through the water. The keel and hull are at their most effective in this regard around the stern and prow where the lines of the boom narrow. But, in the centre of the craft the vessel bulges considerably, as can be seen in this photograph, in order to carry as great a load as possible, and the keel is at its most ineffective. As an incidental note, and although it is difficult to see in this photograph, keels are best formed from a single timber but here the keel is constructed of two timber lengths, spliced together with what appears to be an angled half-lap splice joint. A detail of this photograph is shown below illustrating the joint. Notice, in the paragraph above, that the rudder appears to be relatively narrow to turn a vessel of this size. Bear in mind that, in heavy seas, the helmsman can have difficulties in holding the vessel on its course. Note also the double height of the accommodation that has been added on deck at the stern. Commonly, cargo vessels endeavour to keep their ancillary accommodation clear of cargo space in order to be able to carry as much as possible and maximise profit. The lower detail photograph is of the zuli adjacent to the stern post to give an indication of the scale of this particular craft. This photograph was taken on National Day, 18th December 2008, and shows two of the traditional craft taking part in the celebrations. The craft on the left is a boom, easily recognised by its long prow and tall rudder and, on the right is a two-masted shuw’i with its squared off transom. Both craft are moving under a ‘bad tack’, with their sails pressed against their masts, an effect reducing the potential speed of the craft as mentioned above. Despite this, both craft look beautiful under sail and it’s a pity that commercial pressures make this form of travel uneconomic and only suited to occasions such as this. Finally, here is a photograph I took in Kuwait in 1972 showing what I believe to be a boom with its foresail set as the crew manoeuvre the craft with its aid together with two sweeps or oars. It is here because of the abbreviated satur this boom carries. I have not been able to find out why it has taken this form unless it is a characteristic of the region or, perhaps more likely, an indication of a specialised use. There is also a huwri tethered to the boom, a craft used for moving people and goods between craft and shore. The sanbooq or, sometimes, sambooq – alternatively transliterated sanbuwq or sambuwq – was mainly used as a pearling craft, though occasionally for passengers and other uses. It has a curved prow and flat, relatively high transom with, usually, two masts and a short keel. Its stem head is finished with a single curve compared with the shuw’i’s double curve. The stern of the craft has a vertical timber beam from which the rudder is suspended. The sanbooq’s short keel made it very manoeuverable over the common sandbanks of the Gulf, enabling oarsmen to pull it around. The sanbooq is now used for fishing but was commonly used for pearling. As the pearling season lasted only three months or so, it would have been natural to employ it for fishing the rest of the year, as well as for trading. The abuwbuwz or abubuz, is or was, a craft of the sanbooq type, but now seems to have disappeared, at least from the Gulf. These two photographs of one were discharging cargo on the jetty at Doha taken in February 1972. Had I known more about them at the time, I would have taken more images. Some in the region believe it may have come either from Kuwait or the al-Batinah coast of Oman, but there seems to be no clear idea where it originated. The stern is either rounded or, as illustrated in the first photograph, squared off with a semblance to European ships, then curving as it enters the waterline. This craft also has circular portholes to light the area below the poop deck. The form of the prow of the craft in the second photograph appears to owe its shape to the design of a schooner, another Western characteristic. The stem head or bow fender shown in detail in the third photograph is of a very simple design. In some respects it appears to be similar to an abbreviated stem head of a boom, but has two simple carved designs that give no real clue to the origin of this particular craft. All the traditional Arab boats appear to have graceful lines. The shapes of sailing craft obviously evolved over time. Each is built – as is the practice all over the world – to have a form above and below the water suited to the waters in which the craft will normally sail. The bateel has a lovely, attenuated shape with a beautiful, long raking prow. It was the craft mainly used by the Arabs as a fighting ship because of its manoeuvrability which suggests it has a relatively shallow draft. It was also or, perhaps more normally, used for fishing, a good cover for a fighting ship. Nowadays I believe they are mainly used for oared racing, though this looks as if it is being used for personal leisure. This first photograph, taken in the West Bay of Doha, illustrates the beauty of its lines as well as the shape of its raised lateen sails, a very familiar outline in the last century on many of the traditional craft, even when fitted with engines. In this photograph a bateel sails in Doha’s West Bay, the tall constructions of the New District of Doha forming a rectangular backdrop to its curved shapes. Compared with the bateel above, this is two-masted, each mast carrying a lateen sail. The mizzen mast appears to be of a similar height to the mast on the bateel above, but the main mast is considerably taller and is able to carry a much larger sail. There is considerable beauty in the curved shapes of the sail and its bent yardarm. These, together with the raked prow give the appearance of grace and speed to this type of craft. Note that the yardarm is constructed of two lengths of timber strengthened by binding a third timber to them in the centre. Note that the bateel is moving on what is termed a ‘bad tack’. This shuw’i too is moving under ‘bad tack’, the photograph illustrating the characteristic of the sail setting more clearly. You can see how the sail has been pressed by the wind against both the mast and the rope forestays and backstays supporting it. When the sail is set in this manner the air is unable to move over the sail in a clean manner, reducing the speed of the craft. When moving on the opposite tack, the wind keeps the sail clear of the mast enabling the sail to operate more effectively and giving not just better speed, but also improving the manoeuvrability of the craft. Compare the two photographs above with this photo, taken from the other side of the bateel. The craft here is manoeuvring to bring the wind to bear on the clean side of the sails. As the prow of the bateel moves across the direction from which the wind is coming – as can be seen from the direction in which the stern flag is flying – for a short time its sails lie relatively slack. The bateel is tacking – turning its bow across the wind – rather than jibing – turning its stern across the wind, in order to make progress. Note the scale given by the man standing next to the prow. The prow is distinctive as is the structured stern which can be seen in these next two photographs, regrettably its hull amidships being obscured by a more modern addition to Qatar’s fishing fleet. The lower photograph – a detail of the middle photograph – shows the manner in which the stern post has been raised to support the rudder, and a glimpse can also be seen of the seating arrangement for the steersman, a sort of dikka which appears to be placed on the starboard side of the deck. I don’t know why this is so – whether it is a traditional arrangement or a modern design. However, with the design of the stern being as it is, there is the obvious need to take the rudder up the stern post to support it, in the process producing both a functional and aesthetically attractive design. This photograph was taken in the lagoon associated with Doha National Museum and was taken in the 1970s. It is a half-sized replica of the bateel and is displayed next to another half-sized replica of a baqaara shown below. Note that it is not a true replica, but that a number of compromises have had to be made in creating a craft that is capable of being manned and manoeuvred in its own right. There is an interesting article in Italian describing exploratory work being carried out on traditional craft in Qatar, and which includes a drawing of a bateel. Another article by the same author looks at graffiti of marine craft found at al-Zubara in the north of the peninsula. I understand from talking with Qataris that the jaliboot used to be relatively common in Qatar though there were nowhere near as many as the shuw’i. The jaliboot has a straight keel and squared transom with an almost upright prow, the top of which has a distinctive concave curve to it. Although it is used for fishing, it is also popular as a recreational craft. As an aside, there is an argument that the name, ‘jaliboot’, is derived from the Royal Navy’s ‘jolly-boat’ – a boat which is used to ferry people between shore and a large ship as well as carry out small tasks – but I have also heard the converse argument made as there are many English words that have been derived from Arabic. However, it is perhaps more probable that the name comes to both English and Arabic from the name ‘gellyvat’, a shallow draught war boat sailed off the west coast of India into the middle of the nineteenth century and itself perhaps deriving from the Portuguese ‘galeot’, a galley. Whatever the derivation, there is a significant difference in size between the British jolly-boat and the Arabic jaliboot. A characteristic of the jaliboot is the manner in which the rudder is connected as, compared with the shuw’i and sanbooq, there is no upright timber from which a rudder is hung. Instead wrought iron rings are let into the body of the stern and the rudder is hung from them. Having seen them in action, I have assumed that the jaliboot is a fast and useful craft, and one that was able to fulfil a number of useful functions. These craft were used, for instance, by the State for policing its marine borders. The task of those using the craft was mainly to prevent the smuggling of people and goods in or out of the peninsula, one of the many traditions of the Gulf. As such they were rigged as a traditional craft but were powered by heavy engines and carried small arms in case they should run into difficulties. Note that the sides of the jaliboot have been raised to give both protection as well as mask the deck. The lower photograph is of some of the friendly crew. The jaliboot had moved up on us extremely quickly when we were some way from shore, and it was interesting to experience how effective it was; bear in mind that these photographs were taken in 1972. This photograph was taken on Qatar’s National Day, 18th December 2009, with a fleet of traditional craft being sailed in Doha’s West Bay. Here you can see a jaliboot with, behind it, a shuw’i and, to the left, a kitr, all three under sail. You can see from the number of people standing and sitting on deck, an indication of the scale of the jaliboot and its ability to move people around, a use which relates to the Royal Navy’s jolly-boat mentioned above. The marks on the lateen sail appear to be related to storage. This single-masted craft may be the same jaliboot as that shown sailing above. I have included it as the photograph illustrates more clearly a couple of design characteristics of this type of craft. Firstly, the form of the stern strakes can be seen projecting beyond the squared off stern masking a small zuli hanging at the stern. Secondly, note how the sail spars are constructed from a number of pieces of timber bound together. The central overlap appears to be little more than a metre, considerably less than those employed on the shuw’i illustrated below, suggesting that the spar takes considerably less loading than does the sail spars of a shuw’i. The other point of interest is the casual manner in which anchorage of the craft is made by tying lines to its rail rather than to a specifically designated point at or near the stern. Qatar’s Museum of Islamic Arts, situated at the end of the Corniche on West Bay, and near to the old centre of Doha, has a number of traditional craft moored for visitors to view. Here a jaliboot sits with a small kitr, or similar craft in front of it, and another jaliboot and shuw’i behind it. The jaliboot, like the other craft here, is rigged for sail and it is interesting to compare its spar that holds the lateen sail with that for the bateel and larger craft under sail above. The spar is made up of two lengths of timber overlapped by about a metre and a half, and with a third piece, the length of the overlap, bound to them. It is not easy to see how this has been effected but I would guess that the fixings are whipped and then covered with another material, though why this should be so I am not sure. At the centre of the composite spar a heavy knot has been made around the spar from which two ropes or lines lead to the top of the mast in order to raise and lower it. Note the pair of rope mast hoops that keep the spar attached to the mast. The baqaara is a beautiful craft, designed, as you can see from its lines, for manoeuvrability and speed. They range in length from thirty to forty feet, have a width of fifteen to seventeen feet and will carry around twenty people. The low draft enables it to move over the shallow waters around Qatar more readily than some of the other traditional craft. Note the five sets of rowlocks, the extended, low prow, and the manner in which the keel is extended to receive the stern post. Both the prow and rudder have distinctive shapes, the latter apparently designed more for its aesthetic shape than function, but it does have a length that enables the craft to be turned rapidly. Although the baqaara appears to be a long, sleek craft, you will see that its keel is relatively short, again adding to its manoeuvrability. This photograph of a baqaara, taken at a similar angle to that above, was taken in the early nineteen-seventies following the completion of work on Doha’s National Museum. I understand it to be a half-size model of the craft and, in this regard is similar to the bateel above that is displayed with it. It is here to illustrate something of its rigging which appears to be relatively light when compared with other traditional draft. The photograph also shows the port side of the five pairs of oars which powered it when not under sail. This craft, photographed in Doha’s West Bay with the New District in the background, can be seen to be a baqaara from its long, elegant form. However, the rudder has been added when compared with the two photographs above, creating a slightly different profile when combined with the stern post holding it. Two horizontal timber and one, central, wrought iron straps hold the stern post to the hull of the craft and the rudder hangs off this post. Steering is effect by lines attached to a horizontal timber bar set in the trailing edge of the rudder at strake level. Note how the rudder is stepped in profile, adding a little more refinement to the craft’s profile, but that the amount of rudder in the water is not as great as might be anticipated for a craft of this length of waterline. which is the general collective name given to boats, the word literally meaning ‘wood’ in Arabic. The small boat shown here, beached between two other boats, is such an example, the term applying to any small wooden boat, although the boat I am referring to here might also be a kitr, that is discussed lower down on this page. There used to be many of these craft in use or lying around the foreshores in Wakra, Khor and Doha, but they are slowly being replaced by more modern boats, not all of them made of wood. This is another name, like the jaliboot, which is thought to be derived from the English ‘launch’ – again, or vice versa. The shuw’i was used for both fishing and pearling and ranges in length from approximately seven to twelve metres. This first photograph of a shuw’i shows it under a single sail in the West Bay of Doha, riding relatively high out of the water. A lateen sail is hung from its mainmast and, from the look of its wake, it appears to be travelling relatively fast. If you compare this photo of a shuw’i with this photo above – of a bateel sailing with its sail held against the mainmast – you will see the difference with the sail on the shuw’i blowing free of the mast, allowing the wind to move across the sail without interference. Here a similar, or the same, shuw’i is being sailed under two sails on Qatar’s National Day 2009. Note from its wake that although the shuw’i is making headway, its sails are not drawing wind and it is moving into or out of a ‘bad tack’ with the wind pressing the sails against the masts. Although it is difficult to see from this photograph, the boom of the main mast is composed of four pieces of timber strapped together, a heavy piece in the centre with two finer ones at the top and one at the bottom of the boom. The boom of the smaller mast is composed of three pieces of timber. The impression I have is that the shuw’i appears to be by far the most popular boat in Qatar which appears to have much to do with the flexibility it had in the past, and retains even today. Many of them can be seen in the old port opposite the old suq and at the end of Grand Hamad avenue. For a relatively small craft, it has long, flowing, graceful lines and bears a strong resemblance to the larger sanbooq. Not only does it appear to be the most common boat in the Doha bay, but it is also the basis of the fishing fleets to be seen around the peninsula at villages or towns such as at al Wakra and al Khor where fishing is still a commercial activity and way of life. Here is a typical sight, taken in the morning light with the fishing cages piled on its stern superstructure. This photograph of a small shuw’i illustrates not only its graceful lines and the care that has gone into the detailing of the projecting strakes at its stern, but also the typical arrangement of its two masts and their horizontal booms or spars together with the arrangement of lines, blocks and tackle that ease the work of raising, lowering and adjusting the spars and their lateen sails for optimal travel. In this detail taken from the above photograph you can see how the spars or booms of both masts – and from which the lateen sails are suspended – are constructed of lengths of timber bound together in order to strengthen the centre of the spar while allowing its ends to be relatively slender. This was, and remains, the normal way of constructing these spars. Whether this is likely to have come about from the relative scarcity of suitable timber, or if it is because this arrangement is more flexible in taking the loads placed upon it by the lateen sail, I don’t know. This photograph shows the top of the lateen sail in a little more detail. The reinforcing spar which is whipped to the main spar can be clearly seen and appears to be relatively short if it is to provide the necessary reinforcement to protect the main lateen spar from snapping due to the load from the wind action on the sail. The latter is strongly bowed from the wind loading, but master boat builders will have refined its dimensions and selection of wood over a long period of time. Note that the sail is blown against the mast and rigging as the sail is under bad tack. The photograph also illustrates the pattern of seams in the canvas sail. The edge of the sail has a line or rope sewn along it in order to finish and strengthen it, as well as to permit its connection to the spar. The couplings that hold the sail to the spar do not line through with the seam, suggesting that there is no structural need for this as might have been thought sensible in transferring wind loads. As I noted above, the shuw’i is the chief fishing craft though it does have a large variety of other uses as well, the most common being for recreational activities, particularly with craft converted specifically for this use. But I have seen it used for transporting goods short distances and believe there may still be these boats moving between some of the Gulf states in addition to the larger boom with its greater holding capacity. I understand that they also cross the Gulf to Iran. To the right are two similar photographs of a shwa’i, the first showing its graceful lines, the second with fish traps piled on its stern. These fish traps are a common sight both on the craft as well as piled on the adjacent quay waiting use, or being mended or fabricated by fishermen. There is another illustration of fish traps piled on a shuw’i a little way above. In the photographs above, note the straight, raked stem finished with a long reflex double curve – a detail of which, from a different shuw’i, is shown here – and the transom stern with its transom strakes projected over the sea on which a platform is usually constructed to take the fishing traps, providing more usable space in the open body of the craft. You should also note on the prow the government licence as well as the small good luck symbol, a tradition in many parts of the world. Finally for this group of craft, here are two contrasting images of a shuw’i, the top photograph taken in the West Bay of Doha, and the lower one in the Arabian Sea: the first under sail, the second motor driven. The first photograph shows the craft with its sails set, although the rear sail is not yet under full control, and gives a gives a strong insight into the scale of the craft, and something of its size and capability. The second photograph illustrates the craft at sea. Though the sea is not as rough as it can be, this is a common sight of these craft moving around the Gulf and the Arabian Sea as they transport goods between the Indian sub-continent, Iran, East Africa and the Arabian side of the Gulf. While the shuw’i is not as large as a boom, it is still capable of moving a considerable cargo. Note that this shuw’i is not equipped with a mast and so will not be able to use a sail to save fuel as is sometimes customary. As I mentioned at the beginning of this note on the shuw’i, these craft differ in size considerably. Here are two photographs, taken over thirty years apart of this traditional craft. The first photograph is of a small shuw’i under construction near what was known as the Country Craft harbour in Doha, photographed in the 1970s. Propped at an angle to expose its deck, the general work on its hull is nearing completion and workmen are now proceeding to complete its superstructure prior to finishing and rigging. The angle of the photograph gives a good illustration of the shape of this type of craft. The second photograph, taken in the north of the peninsula shows how little has changed in the design of this type of craft – other than that the stem is straight and not curved as in the first example. Whether this indicates that it is a different craft, I can’t say. Note that there are sloped beams across the craft about a metre back from the prow and forward from the stern. Known locally as a himaar bahr, or sailor’s donkey, its purpose is to brace the construction of the vessel. Otherwise the vessels are similar in their design and construction, both being steered by a simple stern-post mounted sikkan, or rudder operated by a kaanah, or tiller. I have placed this photograph of a country craft sitting on the foreshore at Bida, Doha in the 1970s, in the shuw’i group as it has the characteristics of a shuw’i in the shape of its prow, but with a sharp stern. It can be compared directly in its shape with the shuw’i above it. I understand that boats of this shape are now mainly to be found in the Yemen and not in the Gulf. This small traditional boat was photographed on the foreshore at Wakra in February, 1974. It has been added here as I am not sure what it is though it has obvious similarities to that shown above. I have seen a similar boat named as a double-ended sanbooq, but the shape of the prow here suggests it is more likely to be a shuw’i. However, the shuw’i has a squared transom as can be seen in the photograph above, so my guess is that this might either be a double-ended shuw’i or double-ended sanbooq. Having said that, I have seen a line drawing of a balam nasaari that looks very similar to the lines of this vessel, though the craft shown here does not seem as long as that described in another reference book. It may seem arbitrary to make a distinction between the craft above and smaller craft, but there seem to be so many difficulties around the naming of these smaller boats that I thought it might be more useful to deal with them separately from the larger craft. The main difficulties seem to be that names differ around the Gulf and that boats are adapted to different purposes from those which their forms suggest. This photograph was taken in the 1970s in the old dhow harbour, the harbour directly north of the centre of Doha’s suq. It shows parts of five or six of the small boats used to ferry fishermen between the shore and those larger boats not easily accessible from the shore or jetty. These are working craft and are typical of the type and condition of many of the small craft that were used heavily and on a daily basis not just within the dhow harbour, but also along Qatar’s long coastline. I’m not sure if this is a kitr or not, but I am including it as it is an interesting craft. It is evidently relatively new, perhaps unfinished, as it looks clean and shows provision at the stern for the incorporation of a propellor, yet to be fixed, and is partly decked. The extended gunwales or caprails at the stern are similar to the kitr shown three photographs further up the page, and the photo illustrates clearly at the prow two important elements of the craft. The two uprights are known as bittsand are used to fix anchor lines or ropes to, and the horizontal cross bar is the cat beam– kalba, on which an anchor can be hung. Interestingly the term in English refers to a cat and, in Arabic, a dog. This is a simple craft as you can see from the form of its bottom and sides. It is a balam fudri. The base of the craft is flat and appears to have been constructed from solid planks to which a keel has been attached, and from which the sides have been raised and the stern added from three large planks. It is, in effect, a three sided box and would have been relatively easy to construct, assuming the planks were readily available. Boats such as this can only operate in relatively calm waters due to their inherent lack of lateral stability. Here is a more usual view of the same type of craft sitting in the dhow harbour in Doha. The sheer strake is raised above the level of the stern platform as well as kicking up at the prow, and projects beyond the stern in a similar manner as do the strakes on a shuw’i, but without the length and detailing. Note that the stern area is decked and there appears to be a rudimentary post at the stern which might be there for the fitting of a rudder. There is no similar post on the upturned balam fudri above. It is also notable that masaanid al majdthaaf have been fitted. Here is another small craft in Doha’s dhow harbour. I believe it to be a kitar, the small craft used by the captain of a large dhow, but I have to admit that I’m not sure. Its stern, though not the prow stem, has similarities with the rowing ’abra used in Dubai for transporting people. Its form is more sophisticated than those craft above, particularly at the stern where there is a considerable overhang. The boat has been designed for rowing as can be seen by the incorporation of two robust masaanid al majdthaaf. I can’t see any function for the stern post but it is evident that no provision has been made to have an engine attached or incorporated into the boat’s construction. Part of the stern is decked. However, note that there is no significant development of the prow which, together with the shape of its stern, suggests that it is a modern craft with little or no traditional provenance. These next three photographs may be of the same craft, a kitr; the second two definitely are as I took them as part of a sequence as the craft sailed in, the fisherman dropping the sail and then using the oars to move it to its mooring position. The lower photographs were taken around 1980 from the shore at Doha; the first of these three photographs was taken in 2006 at Wakra. The image of the kitr coming into port with the lateen sail up gives an indication of the power that can be derived from the wind to move this small craft. There is no engine attached to the boat, so its owner must rely solely on the wind and his own efforts to move it around. The image also reminds me of watching abwaam nearing the dhow harbour in Doha with their sails up, and then dropping them to manoeuvre with their diesel engines. The kitr is evidently well-balanced and easy to handle both with the sail up or, as in the lower photograph, with it down and being handled with oars. The oarsman is push-rowing, as it is termed, this being a very convenient manner whereby a standing oarsman can manoeuvre while seeing where he is going. Note that the oars appear to be very simple with large, square blades in order to maximise their effect. This next two craft I believe also to be kitr. In the first photograph it is easier to see its form and, particularly the configuration of its squared, low transom. There is no extension of the transom strakes and the transom is cut low, I suspect to accommodate an outboard engine as has the craft in the photograph below. I imagine steering would be effected by the oars or by a movable outboard engine. Note the shape of the prow in this and the photograph below. This photograph shows two small craft moored beside the Corniche at night near the dhow harbour. The larger craft has an outboard engine mounted on it between the two transom strakes, in front of which is a low-positioned steering wheel though I don’t see why this would be needed with a movable outboard engine. It also has a housing for a narrow mast amidships. The smaller boat, perhaps also a kitr, appears to be similar in design with a similar prow configuration as the larger. There are simple masaanid al majdthaaf, rowlocks, and what might be provision for a rope-enabled steering mechanism, though this would be unnecessary on a rowing boat. This photograph is a detail of one above, taken on Qatar’s National Day, 18th December 2009. It shows a kitr under its lateen sail, a sight that was not uncommon a couple of generations ago. The reason this was particularly applicable to the kitr was that it was an easier way to power the small craft, compared with oars, as it often carried only a single person. Here, with the sail loose, it appears to be changing tack in order to draw wind and make progress with the rest of the traditional craft. I understand this also to be a kitr, though you can see there are significant differences between this and the craft above. The craft was photographed in the harbour adjacent to Doha’s Museum of Islamic Art with other traditional craft and might, therefore, be a more refined version of the kitr. There are obvious similarities in its form while having a more decorated stern with a significant guard rail which is high enough to lean against for anyone sitting in the stern. The shape of the prow, however, is slightly different, this having a more curved shape to it. The boat has a small cat beam or kalba behind the prow, and has been provided with two pairs of rowlocks and associated majaadhif, oars. It is not possible to say from what materials the oar blades have been made, nor why they are circular, but they can be seen to have been bound onto the oar handles with a decorative cross-fixing as is traditional. The rowlocks are timber and have been bound with rope as have the oars at their point of contact with the rowlocks, providing both protection to the timber of both oars and rowlocks as well as preventing slipping of the oars while securing them to the boat. The two small boats in the first photograph were recorded in Doha’s dhow harbour in the 1970s and you will see there are similarities in terms of their form with the kitr. What is particularly noticeable about them is the shape of their prows which not only bear a similarity to each other, but also to the shape of the prow of a shuw’i. There is also a similarity with the curved prow of the kitr above, though the end of that prow has a different shape to it. This next photograph, taken in the West Bay in March 1980, illustrates how these craft were being made more useful to their owners by the addition of outboard motors, an element that combined power and steering into a single, attachable device. Interestingly there appear to be no oars in the boat for use if the motor fails or to save fuel, though these may have been carried ashore for storage while the boat is moored. These next three photographs, showing a pair of small boats, were taken in the Doha suq waqf where a number of items are displayed as, in effect, part of an exhibition rather than as items for sale. They make attractive and interesting additions to the street scene. Whether or not the craft is for sale, I believe this qualifies as a huwri as they are essentially small craft designed to take people from the shore to their larger boats. The peculiarity of this boat is that it is not constructed from planks, but is carved out of a solid piece of timber. The wood must have been brought in for the construction as well as, I assume, the boat builders who come from Kerala. These craft have existed in Qatar for centuries, but are believed to have originated in the Indian sub-continent. At the bow and stern the difficulty of fixing planks is avoided in this form of construction, and the craft will be significantly stronger – but less flexible – compared with standard planked constructions. Its stability is, however, dependent both on the skill of the builder in creating an evenly balanced boat with an consistently carved thickness, as well as the characteristics of the tree from which it was crafted. In addition to this, the timber must still be looked after properly in order to avoid or ameliorate the problems of shrinkage, warping and cracking. Three further points are worth noting on these photographs. In the upper photograph you will see that the shape of the oars are virtually circular, a shape which provides an efficient area, but which is not as efficient in water as an elongated shape. The second point is that although the first of these craft appears to have a rowlock attached, my understanding is that they were paddled and not rowed. Thirdly, in the lower two photographs you can see, lying across the seats, a mast and boom which can be raised at will in order to give the oars or paddles a rest. The first of these two photographs shows how the rowlock is attached to the inside of the craft, and the manner of adding hemp ropes to provide a degree of protection to the rowlock and oar. The second photograph shows that, by distinction, the rowlocks of this kitr has been fixed to the top strake of the craft. Here are some working huwri, all taken in the 1970s and 1980s.This first photograph was taken in Wakra and shows two fairly primitive boats, the farther one being a huwri. As you can see, it is of a very simple design and construction, the sides buttressed by a single piece of timber for a seat, and showing considerable signs of wear and tear at its prow, suggesting that it was of quite an age when I took the photograph. Although they can’t be seen in the photograph, there are ribs to strengthen its base. The second photograph shows a huwri working in the dhow harbour in Doha in 1973. It has much of the appearance of a canoe, but its colour is what first drew my attention. It is just possible to see some of the ribs that have been introduced to strengthen the bottom of the huwri at its junction with its sides. It might be assumed that these craft are constructed of three planks, one as its base and two for the sides, and then strengthened with the ribs at their junction, but I believe this is not correct. The last two photographs are also of a huwri, this one apparently having been abandoned outside Wakra in 1983. Note that there are no seats in the centre, though it should be assumed that there were at some time. Again, this craft has suffered significant mechanical damage at its prow, but the photograph is here because there are two details to look at which are interesting. The first is the detailing of the ribs. As mentioned above, they appear to have been incorporated in order to strengthen the hollowed out construction of the craft rather than to fix a base to two sides. The second detail is that there are two pairs of circular marks on each side of the craft. Although these might appear to be for the insertion of a pair of misnad al majdthaaf, perhaps in the form of pins, to contain the shaft of an oar, they are obviously too small and show no signs of wear. It is likely that these craft were paddled, and that the marks are the remains of vertical fixings, probably wrought iron nails, securing horizontal wooden bars or seats to the top of the sides of the craft. Boats carved out of solid trees are wasteful of resources, labour intensive and take time to complete. There were not trees in Qatar suited to the construction of this type of boat so, whether these craft were brought in completed or whether they were constructed in Qatar, it is not able to be certain. With time this difficult process was refined into craft having a keel, a frame – the ribs – and carvel planking, a better use of resources. Carvel planking, or smooth planking, is a type of construction where planks are butted edge to edge. In many parts of the world this gave way to clinker planking where the planks were overlapped, a generally more sound method of construction. I had thought this to be a katar or katter, a relatively commonly seen local boat. But I now understand it to be a shahuf, a double-ended fishing craft, common on the east Emirates and north Omani coasts. Shaped at both prow and stern, this craft has clean lines and looks to be a modern or expensive construction, though still relatively flat-bottomed. This particular craft has a small deck fore and aft. This beautiful little craft has obvious similarities with a bateel. Although it appears to be unfinished, it is obviously considerably smaller than those bateel shown above, has a different character of deck, and a slightly different decorative prow and stern arrangement. The stern of the craft has similarities with a baqaara in that it clears the water line, manoeuvring of the craft being dependent on an external rudder, oars or sail. This type of craft used to be known as a garookuh, a hybrid between the the Musandam zaruwkah and a badan. I now believe it to be a half-sized replica of a bateel, as mentioned above. The second photograph illustrates the characteristic fiddle-headed shape of the prow of a bateel selek. These craft once used to be sewn together but are now constructed as most others, with iron nails. This photograph is of the same craft, this time moored with a clear view of its stern to which is temporarily tied a sukkan, or rudder oar. It has been constructed of a shaped plank with a bar attached to it and a pair of notches cut from the edge of the plank, suggesting a rope connection. Exactly how it is fixed and operated, I am as yet unable to say, though they are invariably hung from the fashin, or decorative tail fin, on the starboard side of the craft. As yet the boat appears to have no means of propulsion incorporated into it. In Qatar, this type of craft is known as a jals or jals lal-sibaaq. These boats are designed and built as racing craft and, as you can see, are powered by thirteen or fourteen pairs of oars. The craft are brought out on high days and holidays in order to race against each other with teams drawn from the traditional villages or littoral districts associated with pearling or fishing, and even with teams from other Gulf States. The two photographs were taken of these craft on the Corniche on official holidays in the 1970s, as can be seen by the buildings in the background, but there is now a feeling that the racing has more to do with tourism than it has to do with traditional rivalries. There are three particular things to note here; firstly the manner of dress of the crew, secondly, the shape of the oars and, thirdly, the number and arrangement of oars. There appear to be six sets of rowlocks on the near side of the craft, but they are not evenly spaced. Not all the racing craft are as long as those illustrated top, above, or those below. This boat, photographed in 2012 is similar, though a little shorter in length than that immediately above, is arranged for ten sweeps, but has a very different stern arrangement. Not only is the stern pointed rather than havinged a transom, but the stern post profile is not straight, the inside of the rudder curved to match it and hanging on iron pins attached to it. This craft appears to be a more modern and sophisticated design than that above. Note also that the sweeps or oars are modern in their design and construction, though they still have hemp rope around them which will be attach to the rowlocks to prevent their slipping. Here are photographs of two different boats, empty of crew, without and with oars, and moored adjacent to the Corniche awaiting later races. It can be seen that there are fifteen pairs of masaanid al majdthaaf ranged along the length of the boat, but at least one pair – that right on the stern – can not be used for rowing. I assume that they are there for decoration or, perhaps, for a form of manoeuvering. What is noticable is that the craft appear not to have rudder posts, but that there is provision for the provision of a rudder off the stern, hanging from a post fitted inside the stern transom. The lower of the two craft has a rudder attached and, on the two boats in the first photograph of two racing craft, rudders can be seen on both craft. The colours of the teams are shown in the flashings on their oars. This first photograph gives an indication of the graceful lines of this long jals, drawn up on the shore of the east bay of Doha. Looking towards the stern the curve of its top or sheer strake indicates how this simple craft must have developed its form in response to requirements and experience over time. Note how the boat is propped by having two posts, one each side, lashed to single rowlocks. This view of the interior of the jals shows that it has been designed to accommodate pairs of rowers, each operating a single oar tied to a fixed rowlock. The masaanid al majdthaaf are integrated into the structure of the craft and take the form of a single post that is wrapped in hemp ropes to provide a degree of protection to the wooden post from the oar tied to it. Along the centre of the boat runs a plank on which access along the length of the boat can be obtained between the sitting rowers. It is not possible to see if there is a footrest fixed to the structure of the craft. Here is another view of the interior of one of these juluws lal-sibaaq, this time taken in Sheikh Faisal’s museum. It is difficult to tell, but it appears to be designed for single rowers each operating a pair of oars. Note that there are no footrests for the rowers. There are a number of interesting things to look at here. Firstly the tall misnad al majdthaaf which have the oars bound to them with hemp rope, the rope providing a degree of protection between the majdthaaf and rowlock during the stroke. I’m not sure why they are taller than their functional requirement, but they give a distinctive appearance to the craft. The second thing to notice is the shape of the oars. Again I can find no rationale for this particular shape as racing oars tend to have different profiles, in particular they do not narrow at their tip as do these, thereby reducing the effort put into propulsion. As you can see, the boat is of modern construction, the ribs being formed of squared section timber and with the horizontal sheer strakes, into which the misnad al majdthaaf are set. Finally, note the relatively shallow draught of the boat which would have enabled it to move through the shallows commonly found off the peninsula’s coast and which, to some extent, protected littoral settlements in the past. This craft is or was known in Qatar as a huwriyya. However it is probably more commonly known as the shaasha, not just in Oman where it was relatively common, but also on both sides of the Gulf. It takes around two days to make one and, being constructed from the spines of the leaves of the date palm, is inexpensive. More than this, however, is the fact that it is extremely stable due to the way in which layers of palm stems are used to provide buoyancy creating, perhaps, more of a raft than a boat. It copes well in rough seas and surf and is liked because of its flexibility compared with wooden craft held with iron nails. These craft need to be drawn from the water as they become waterlogged if left in the sea, owners tending to have more than one in order to enable those out of the water to dry out. I have never seen them used in Qatar but it is possible if not probable that they may have been used by offshore fishermen in the past due to their inexpensive materials and ease of construction. They last around three years in normal use. 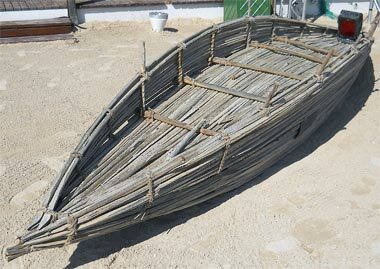 There were apparently forms of this craft used in the past in Bahrein and Kuwait, but named differently – firteh in a fishing village in Bahrein where it is punted, and waariyya in Muharraq and Manama as well as in Kuwait. There are a number of other craft used in the region of the Persian Gulf and Arabian Sea. Some of them, like this boat, pulled up onto the foreshore in Doha in the early 1970s, are similar to traditional craft but have been constructed differently. Notice here the narrow planks that form her hull. To make identification a little more complex, different areas may have the same boat with a different name, and dialect can further alter its spelling in Arabic. Even worse, the transliteration into English often differs which may account for difficulty in differentiating, for example, the keet, kit, kitarand kitr. At present I am unable to define them clearly, but will add them to the definitions above, as and when I have more details.